Craving something savory? 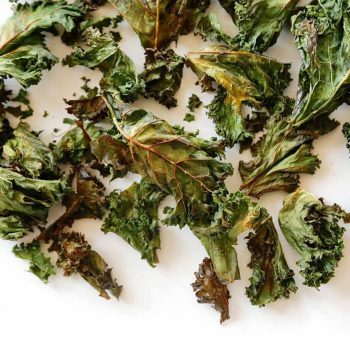 How about these delicious 15 minute KALE CRISPS for a clean snack and healthier alternative. Kale is amongst one of most nutrient densed foods. It’s full of antioxidants, an excellent source of Vitamin C, lowers cholesterol and is a great source of minerals that most people cant get enough of! Preheat your oven to 160 degrees. Having washed and dried the kale well beforehand, remove the stems from the kale leaves and lay onto a baking tray. Add the little oil and rub in. Then add rest of the ingredients and pop into the oven for about 15 mins, keeping an eye on them so as to not to over burn. Once cooked, remove from oven, let cool and enjoy!